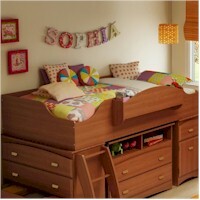 What’s not to love about the SouthShore Loft Bed from the Imagine Collection? This environmentally friendly bed by SouthShore Furniture is the perfect height, so parents can give extra tuck-tucks to their child at bedtime. This loft bed also includes a safety bar to ensure your little guy or girl can’t roll out at night. The storage units below the bed offer lots of space where kids can keep clothes or their favorite books, while not taking up extra floor space. The center, under the bed, is roomy enough for a storage unit or you can leave it open and create a fun kid hide-away that’s open or covered. Learn all about the stylish, functional, space-saving SouthShore Loft Bed from the Imagine collection by watching the following video or visit us at SimplyKidsFurniture.com for more info and pricing.